A great looking website for an excellent and much needed service in the property sales sector. Group buying brings a group of buyers together with the common goal of buying their own properties in a development – the group results is some serious bargaining power! Single home buyers can also harness the negotiating experience of buyTogether to potentially gain significant reductions in house price. The propertySearch & Select service aims takes the drudgery and heartache out of finding and buying the perfect home for you – buyTogether can do it all for you! Developments– this is an interesting and timely idea which looks for opportunities in unfinished developments around the country. And finally buyTogether also offer their skills for negotiation and renegotiation of rents and leases in the commercial sector. I know a few people straight off the bat that would seem some very tangible value in getting a few percentage points knocked off their leases!! 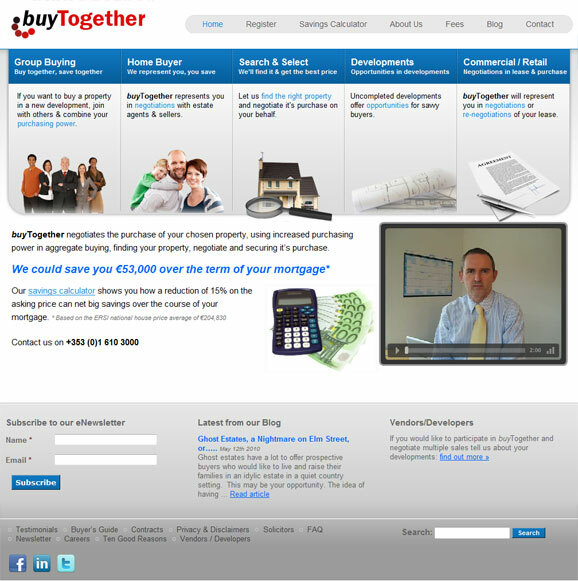 So – there’s a lot of very useful offerings available from the team at buyTogether. One of the challenges for us was creating a homepage that not only looked good (easy for us!) but also gave all 5 offerings equal footing with the just the right level of information to explain to but not overload with information – (not as easy!). In the end, after a lot of design work, some user testing and a few tweaks here and there we pulled it off and we, but most importantly, our clients are delighted with the results. Check out the buyTogether homepage. Also you might notice on the homepage is video – which aims to explain simply and clearly what buyTogether do. It also gives you, the visitor, a chance to meet Gerry Kidd, one of the founders and get a sense of the people behind the company – available, knowledgeable and approachable. The perfect execution of the mortgage savings calculator was paramount. It shows not only your mortgage repayments and stamp duty but also what potential savings you make across the board if you are able knock of a few percentage points form the asking price. We all surprised to learn after some of research that many of the mortgage calculators across a range of high profile property and banking websites simply didn’t work; with inaccuracies in stamp duty the most common issue. Tim Sheahan had spent some time developing the mathematics behind the buyTogether calculator and it was up to us to ensure that it went from Excel to WordPress without a hitch. Our big thanks go out to Alan O’Reilly from Tidy.ie who worked his magic (several times) in the development of the calculator for the website. It is an extremely handy little tool and it works. Be sure to check it out. There are lots of small pockets of goodness throughout the rest of the site notably the eNewsletter form that deposits the subscribers details directly in Mail Chimp’s (our eNewsletter software of choice) mailing list database. There is a also a nice little widget at the end of selected pages and posts that allows you to share the page/post socially through facebook, twitter, etc. And of course there are some excellent examples of registration forms – about five! – that can be modified and processed all within the WordPress administration area. Handy indeed. Oooh and did we mention that we designed the logo as well? We will leave you with words from Gerry and Tim on their experience working with Cookie Web. Thanks guys! In writing our brief for our new website we had a good idea of what we wanted to achieve but really had no idea how to deliver the end product. We had spoken to many wed designers and received quotations which really tested our budget. From a chance meeting at an Kilcock Business Association presentation, we were fortunate to enlist the services of Heidi and Orla at Cookie Web Consulting. From our very first consultation they grasped our business idea and understood our requirements, perhaps even better than we did ourselves. Together we have developed a website that ticks all the boxes and we are looking forward to using it as the shop window of our business. We have received many commendations from business associates regarding the look, ‘feel’ and usability of the site, which is testament to the professionalism of Heidi and Orla. The calculator is a very important element of our website and its development and user friendly presentation as a unique tool within the financial services sector owes much to the girls expertise. We have no hesitation in recommending Cookie Web Consulting and we look forward to further developing our website as our business expands.